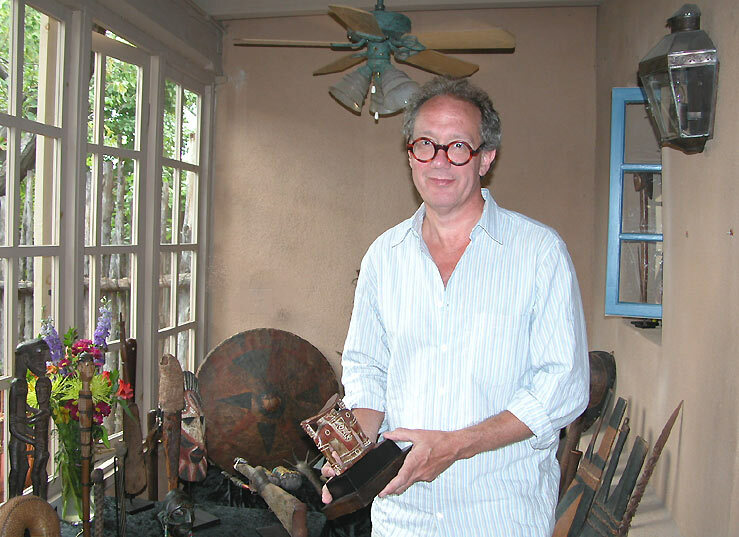 Kevin Conru is very well known in the Tribal Art community as an internationally acclaimed dealer and collector. His consistently fine quality tribal material, his life achievements, and extensive knowledge of Tribal and Ethnographic Art has earned him recognition from his fellow dealers, trust from institutions, and private collectors. I recently met with Kevin at the charming "Water Street Inn" in Santa Fe New Mexico, during the run of the Tribal Art shows. We chatted on the outdoor terrace over a cup of morning coffee. The following is a transcript of his thoughts on a variety of topics. ​What was your path to becoming a dealer? I studied classical music at the university, in particular double bass. Performance is what I did for a number of years and played professionally in symphony orchestras in Chicago. I moved to South Africa when the Orchestra started in Durban, then off to Hong Kong when I met my first wife who was S. African. We had the choice of going to Memphis or staying in Hong Kong , we thought Hong Kong was more interesting. Because of the claustrophobic nature of Hong Kong and my small salary and small apartment, I had a longing for African (South Africa) in a sense, the space, the sunset, the romance… and you know having lived year round we had a few African things, you know gourds; stuff you would buy at curio shops in Durban. I remember I had a pair of modern Ci Waras I bought at “Ivys” in Johannesburg . This was about 20 years ago in 1985. So that was just my interest in the culture. I left Hong Kong and the Orchestra in the end and went to London . I wanted to change careers because I got a little bit tired of the symphony life although I loved the music. I did my masters degree in London . It was an MBA on Arts Policy Administration for museums. I used for some of my research the ethnographic museums because I sort of carried a little bit of the African thing through, not really knowing about the art per se; but just buying books and looking at pictures, going to the British Museum (Pitt Rivers Museum) and attending a few auctions. 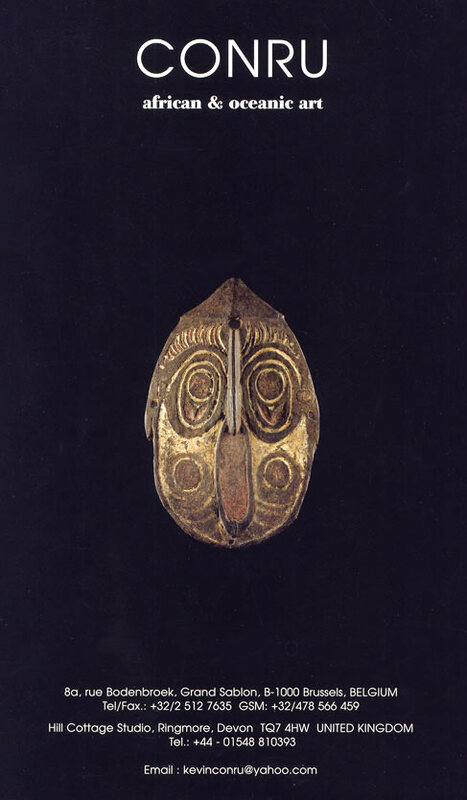 I sort of became interested in African Art. After a year of study I got my degree…be that as such, I wanted to stay in London . 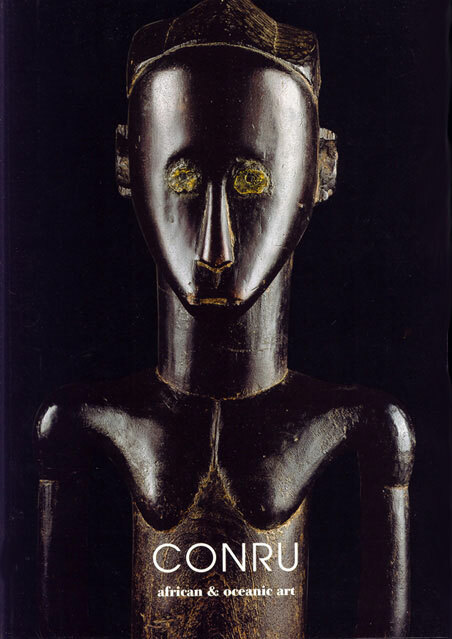 In 1987 I convinced Bonham’s which was a small auction house then, now of course they are enormously big, to start a department of African Art, Tribal Art and Antiquities. I don’t’ know if that was a good thing or bad thing, but we started it in London . My African Art experience initially was a disaster. The first sale was terrible, a “crime against humanity” auction. Fortunately, they had the courage to back me for another auction. I learned very quickly. I had five people in the audience the first auction. One of them was Pierre Loos who took me aside afterwards and said, “you had some nice things (which was of course he bought for no money) and the rest was crap". Come to Brussels for you next auction and I’ll give you stuff that will at least be real”. Auctions in London were tapering down at this time in the late 1980s. Sotheby’s had just hired Jean-Baptiste Bacquart to run the few small sales. Then in the early 90’s both Sotheby’s and Christie’s basically packed up and went to New York and Amsterdam because the market was just drying up; at that stage I went privately as a dealer in 1992. I was leaving the auction house behind (Bonham’s) after 5 years there. The antiquities, the Asian art and the other departments remained strong. Their Antiquities department had a sale about a month ago where they made 11 million dollars in 25 lots from a very important collection, so there is still great strength. I’m very pleased to see from the small beginnings how these things went. Tribal Art in London has stayed on a very small level, and that’s why I left London altogether. I did my first black and white catalog in 1995 in London and also exhibited at the Royal Academy show of the continent. This was I think probably the last year Christies was there, maybe 1996, Sotheby’s was gone by then. I did consulting for a few years. There was always a bit of “pull”. In June the international tribal art community would come to Christies and because London was always a magical place to find things. This was true whether it was Polynesian treasures, or American Indian or African, mainly ethnography of course but odd sculpture would turn up, because the English collected a lot of things. England and the UK, even with the channel is still an Island cut off from the continent; you just can’t get in your car and “willy-nilly” drive to Paris, Holland, or Germany. It is a little bit of an extra effort to get there. So people didn’t just think of popping over and if they did, they were the French and Belgian’s who were all of course looking for real bargains. The younger dealers arriving would find simple ethnography which is all that was left. There was not really any money or professional standing left in it anymore. The cost of doing business in London was just too expensive. It’s outrageous, property; everything in London makes it an expensive city. That is why over time I decided to move a part of my operations to Brussels . I’m an English resident and keep my residency there. So I keep my main operations in London and I go back often because we have a house there. I’m in London once very couple weeks, and I still do find things there. What is your philosophy on selling? As for selling, it is an international world as we know. That’s why you see me everywhere doing all sorts of things; because the market place for good pieces is global. You know that as well Mike from your work on your website, which is very clever the way you market your material. It's fabulous, it’s like your gallery is all over the world. I don’t do that. I probably don’t know how to do that, but I seem to get by with what I do. There are many people in their 50’s and 60’s who are the major buyers but don’t use the internet to buy. I think I have an affinity for anything very very good! The real crux of the biscuit, when I think about what I really like, is very beautiful objects. Now, I started my South African collection ten or twelve years ago when I was still in London , when I didn’t have a lot of money and the things were beautiful and a little bit affordable and available. All those ingredients conspired to create an interest; if you can find nice things on a pretty regular basis through sources. That’s how my collection got started. I’ve always liked South Pacific material, coming from my surrealist sculptural interest. Also in England you tend to find more South Pacific items. For every quality African thing that came in, I had five South Pacific things….now that maybe ethnography again, but there was an interest there. 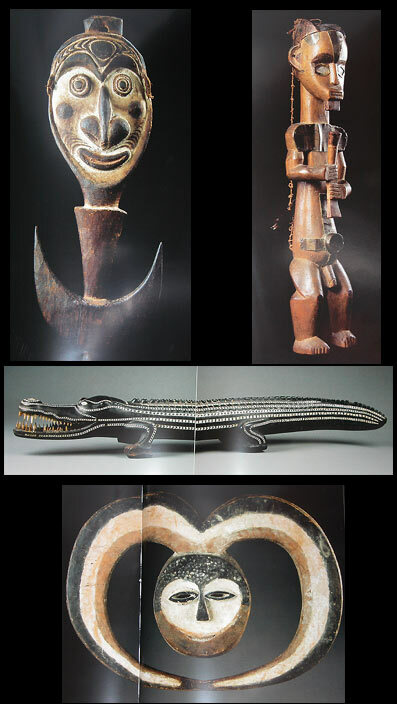 Great African sculpture is also wonderful… hard to find, well everything is hard to find obviously. Seventy Five percent of my business is African Art, Pacific is less. In one sense at home I have a few things that are Pacific, but quite honestly it is only because the African Art comes and goes much more quickly. So I have Pacific things I get noticed for. I think I see people branching out as well. There use to be a time when African Art Dealers were just “African Art Dealers”. Those days are changing, now one has to perhaps have a bit of American Indian occasionally… something a bit interesting. I would like to have more American Indian material, but I don’t really have the clients for it and it is quite expensive. I think the middle quality for American Indian is expensive. An Eskimo mask for $35,000 is not always that wonderful to look at and you can’t get it for much less than $32,500 so the margins are small too. I don’t have any philosophy on buying whatsoever, other than I look at a piece and evaluate its aesthetics, figure out if there is money it, quite honestly, and perhaps what I think I can achieve. I just tend to get the best piece I can buy. I love buying pieces. If it is a great piece I’ll try to buy it. I tend not to buy medium quality pieces. I noticed at Bruneaf (Tribal Show Brussels) this year there was more interest in medium pieces and I didn’t have that many medium priced African Sculptures. A friend of mine is Steve Alpert, who I admire very much as a dealer, because he has a much focused eye. Perhaps it is just the way he arranges things that makes it exciting, when in fact he is just doing what we all do and buying beautiful things at the right price. But coming from an auction background if I see something inexpensive laying on the ground and there is money in it I’ll buy that and move it along or give it to somebody else to sell. Here in Santa Fe I meet a lot of people, astute collectors, new collectors who ask what I think they should be doing. Some people are at the end of their collecting, some people are at their beginning. I’ve often thought that the best thing any collector could do is to buy the best that their budget can allow. It is very simple. It is not often followed because many collectors like to buy three things instead of one. Even people with all the money like to buy smaller objects and may not be comfortable with this idea. A lot of it is subjective because what is a “masterpiece”? Why is one thing worth more than others? For instance, I have recently acquired an Arawe Shield from New Britain with the three bands and the circles. I’ve had many and there are many around of all ages. As an object type it is quite interesting. From the 19th century when the first ones were collected, up until fairly recently in the 80’s and 90’s when the last ones were collected. I’ve sold about 15, generally good ones. I try to keep the level high where the pigments are all natural. This one I just got, I’ve only had one other as nice. It is an old 19th century one but it has a "price". Some people may find it hard to see the difference in this and one that was made in the 1960s. Yes, they all have the circles and all have the binding and painting on the back; so what’s the difference? Well there is a difference, subtle differences, that’s what I’m talking about when I say: does someone buy the best, or something which makes them feel comfortable on a budget, where you get just as much bang for the buck. I always say, try to buy the very best, but I also recognize that very few collectors follow that rule because they all have different modus operandi for buying. In the end the collector is the winner, right?! I find my philosophy is much better to be supportive of the collector, and their ideas of what they are trying to do; rather than strictly impose my own perspective. If I did this I would very quickly be out of business. To sit here and look at Santa Fe , with all of the shows, events, and galleries, I would say the market for tribal art is “exploding”. There is an explosion not necessarily at the high end but for stuff and interesting things—a lot more interest. I see that also in Europe ( Paris and Brussels ); the marketplace has truly expanded in the last ten years. I’ve watched it across the board. There are more collectors and much more interest. Between Paris and Brussels there is a lot more going on exponentially than there was ten years ago. Quality wise of course is another thing. Masterpieces are harder to find, but they are out there. With a reasonable amonut of money, one can still built a great collection today. There are still in private hands most of the great treasures, so there are many opportunities still there. People say it is not like the old days. Yes, I know the old days there was Webster, you could go there and he was tripping over stuff. Now you have to look a little bit harder… but it is possible. It is one thing to have Tribal Art kept for the connoisseurs and esoterica. Exposure-- I’ve seen this in exhibiting fairs. They are a fairly recently phenomenon. Fairs are quite good for this field because the public can go and see a lot of material under one roof in a fairly short amount of time. What it comes down to is how the material is presented. Thinking about how the material is displayed can quite honestly attract new people. Is it pleasing to look at? I find a lot of displays very ethnographic and old. I’m not saying it is bad, it is interesting, but a new person can be a bit more stymied by seeing thousands and thousands of things all looking similar, stacked up in groups. You tend to find that in American Indian events, that sort of material does tend to run into each other (baskets, blankets, etc.). It’s difficult to give enough space to each object, so there is little chance for someone possibly new to focus on them. It is always ok for the connoisseurs; of course most of what we do is preach to the converted. If there is a way to find new people it is “presentation” no matter whether you’re in a booth, a crowded fair, a hotel room, it always comes down to presentation. I’ve just finished the second week of an exhibition of African Art with my friend Billy Siegal at his gallery in Santa Fe (135 Palace Ave. #101). He came to me in Brussels and said “would you like to do something”. I had been coming to Santa Fe every year, but not really doing anything with my material. So I said, “okay this is great.” Normally my material is in storage in Europe . He and I did some business, met new clients and it was fun. Then, I’m back to Europe . I’ve worked on my Bernatzik photographs, setting up an exhibition at the Linden Museum Stuttgart of South Pacific photographs. I acquired the archive of the photos from the heirs through a connection in Austria . It is a significant archive, the only one left in the world in private hands, it is incredibly important. The books we’ve published have had a lot of interest. There is also the Paris “parcours des mondes” fair (starting on September 16th). And then of course gosh knows what we’ll be doing… we’re doing something! The most exciting thing I found was the thing I bought yesterday, this is always the case isn’t it. Quite honestly that’s the excitement. I’m not saying this was my most important purchase. As a dealer, to stay fresh the most exciting thing I bought was what I bought last. That’s how I think about it. I have in my own collection a Solomon Island inlaid shield, Mundugamors (Sacred New Guinea Flute Stoppers from the Biwat people, Yuat River ); quite important material that was very exciting at the time they were bought. The latest things I’ve bought are the most exciting things. When that stops, I will stop. We Extend a warm thanks and gratitude to Kevin Conru!